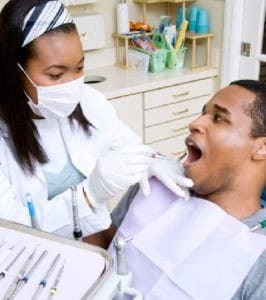 Eating and drinking some foods can ultimately cause teeth to be stained in a way that brushing your teeth will not solve. Your Alpha Dental Center dentist can provide teeth whitening options that take place either in the office or at home. The brands we offer: Philips Zoom!® and Opalescence® provide dramatic whitening without the side effect of tooth sensitivity. At your appointment, we will look at the stains on your teeth to determine if whitening is the answer for your problem. 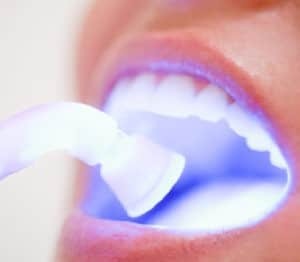 Teeth whitening is effective at reducing stains caused by outside elements, but stains caused by trauma or some medications will not respond effectively to whitening. Such stains would benefit from porcelain veneers. At your appointment for In-Office whitening, your professional will mix a hydrogen peroxide gel for you and apply it to your teeth. Then, a special light will be directed at your teeth to activate the whitening agents. The light will last about 15 minutes and then the gel will be removed and the process will be repeated twice more. Some patients prefer to do the whitening at home, at their convenience. For those people, we provide customized whitening gels and trays. In this process the gel is applied to the tray and the tray is worn for about 30 minutes a day for around 2 weeks. The improvement will be obvious: your teeth will appear whiter after several days.